Tatiana Rugers loved art since she remembers herself. She took many art classes during her student years from high school through her college years in Moscow, Russia. After obtaining masters degree in computer science Tatiana worked in that field for many years but she never lost her love and passion for art. When Tatiana moved to the United States 16 years ago opportunity presented itself to her to work in the area where her true interest lies, art. Tatiana works as a professional artist and continues to take many art classes in USA and abroad. She studied under many world-renowned artists, such as Pascal Amblard, Pierre Finkelstein, Nicola Vigini, Sean Crosby, George Zaffle, William Cochran and other leading artists in the industry in Europe, Russia and United States. 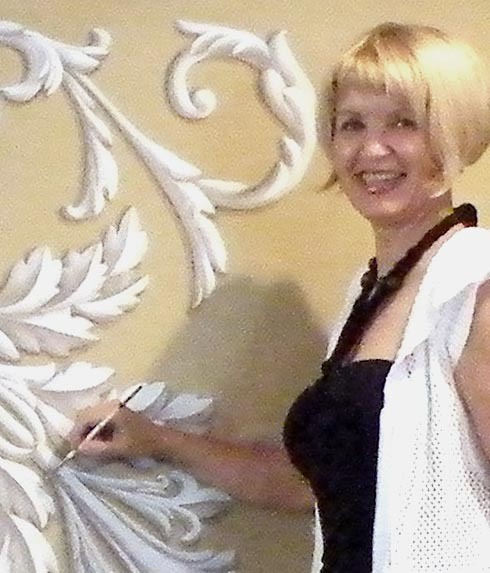 Tatiana's company, 'Creative-Ambience', specializes in custom murals, Trompe l'Oeil and other forms of decorative art. Her work adorns walls and ceilings of estate homes, restaurants and corporate clients. It is important to Tatiana to really understand views and diverse cultural backgrounds of her clients and integrate them into her vision and her work. Tatiana believes that art helps bring people together as it is a beautiful and powerful form of communication. Art is her true passion.